I worry about him a lot. I worry that he will be a victim over and over and over again. I worry that he has already been a victim of bullying. I know it is going on in our house. His younger brothers, ages 5 and almost 8, bully him all the time. Their actions, the way they talk to him, the way they exclude him, the way they blame him - it all adds up to bullying behavior as far as I'm concerned. It makes me really sad, and really angry, that this is happening. Though, I can't help but wonder to what degree Hubby's and my behavior has played a hand in this. 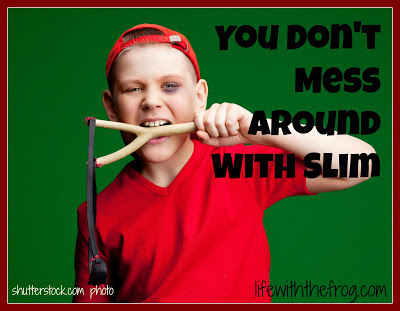 Slim's behavior is, at the very least, frustrating. On it's worst days, it's absolutely maddening. It's difficult to be patient with him: sometimes, almost impossible not to be infuriated with him. So we snap and we growl and we yell. And the other boys see this lack of tolerance on our parts. And they think that's okay. And this makes me so sad. How can I possibly scold them and try to teach them proper behavior if I can't muster the patience and tolerance myself? It's a tough road, one I spoke about on Her View From Home the other day. It's so much easier to lose patience than it is to hold it, steel yourself, put on a smile and a calm voice and issue a polite request. Because, let's face it, sometimes you've just had it! Yesterday, I was meeting Hubby and the boys somewhere. Hubby pulled up next to me in his car, and we were talking through our open windows. The three boys were in the backseat of Hubby's car, Slim in the middle. Excited to see me, he leaned across Knox to talk to me. "Slim! Get off me!" Knox yelled and pushed him. But Slim kept leaning on him trying to talk to me. Yes, you say, this is normal sibling behavior; BUT, this is the tone with which Knox always uses to address Slim (because Slim's behavior IS annoying), and he'd had it. I watched as Slim delivered a right cross to Knox's chin. To which Knox responded by pushing him more forcefully. To which Slim replied by delivering another perfectly placed, even harder right cross to Knox's chin. My mouth was open in a mixture of horror and pride. Pride, I tell you! Because our son, who is awkward and uncoordinated and small for his age and avoids conflict like the plague - all of which could make him a potential victim - showed us that he is capable, and certainly not afraid, of standing up for himself. Later, I said something to Hubby. "Did you see that right cross that Slim delivered to Knox? I was a bit mortified, but sorta proud." Hubby shrugged his shoulders and blew out a puff of air, "Eh, I figured something was going on back there, but they're boys." I've tried to cultivate a loving, gentle culture at our house - love and be loved. But I'm going to have to face facts that at some point in their lives, my boys will get into a fight. It's nice to know they'll be able to at least defend themselves. I can't help but think about that Jim Croce song, "You Don't Mess Around With Jim." And you don't mess around with Slim"
I think it's safe to say that his brothers are learning that you truly don't mess around with Slim. What do you think about kids - boys or girls - using their fists to defend themselves? It's a touchy subject, isn't it?